BeginnersWant to start playing the harmonica (otherwise known as “Mouth Organ” or “Harp”)? Don’t know which one to learn to play on? In this section we have selected good and affordable starter harmonicas for beginners. We recommend starting with a harmonica in the Key of C. This is a great place for beginners to learn how to play and once you have mastered playing a few different songs, then we recommend you look to new keys and more advanced songs. EasttopEasttop harmonicas were founded in 1997 by Jiangsu East Musical instrument Co. LTD. They employ over 500 skilled craftspeople in their 15,0000 square-meter factory, located in Huai’an, China Easttop Professional Harmonicas are hand-crafted using imported reeds, in order to assemble harmonicas of unsurpassed quality at very affordable prices for consumers. Easttop have skilled workers that create world-class products, while strictly adhering to international standards in a friendly, caring environment. They have a strong focus on mutually supportive teamwork that allows them to manufacture some of the finest musical instruments in the world! Brendan Power utilises the manufacturing of Easttop and has developed the Lucky 13 and Asia Bend harmonicas with them. 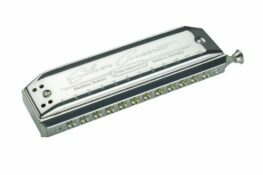 FenderFender harmonicas are a relatively new addition to the line of products offered by Fender Musical Instrument Corp. Aimed at beginners and experienced players alike, their harps feature durable plastic combs and brass or phosphor bronze reeds. The Blues Deluxe is a competitively priced entry level harp, whilst the Blues Deville goes head to head with Hohner’s Special 20 for quality and tone. The company itself is best know for its guitars and amplifiers. Leo Fender, the founder, recognised the potential of the solid body electric guitar in the 1950s, and created one of the first mass produced instruments of this kind – the Telecaster. Unlike contemporary Gibsons, this featured a cheaper single cutaway body, made from a less exotic wood than Gibson’s mahogany, and also had a bolt in neck. Both of these measures kept prices down, enabling young people to buy electric guitars and, thus, kick started the rock and roll revolution. Today the company is one of the largest manufacturers of musical instruments and amplifiers. PignosePignose have been making amps for over 40 years – since 1972. The first Pignose amp debuted at the 1973 Summer NAMM show. Pignose amps have been engineered and designed with reliability and portability in mind, making them the ideal harmonica amp choice. BlowsMeAway ProductionsBlowsMeAway Productions was setup by harmonica enthusiast and band member of Blue State ‎Greg Heumann‎ in 2004. Greg has been putting out innovative products and services for over a decade: 2004: Vintage Volume Control, 2005: XLR Volume Control, 2006: Custom Wood Microphones, 2006: Kalamazoo Rebuild Service, 2008: Ultimate Microphones, 2010: Bulletizer, 2011: Wireless Systems, 2014: The Heumann Element, 2015: Bulletini Microphones and now in 2017: Rackit! ‎Greg Heumann‎ is a performing harmonica player and uses his machine shop, wood shop and engineering lab to help put out top quality harmonica products for the world. SonnyboysSonnyboy’s harmonicas were created in 2008 by Pete Smith & national harmonica league chairman Ben Hewlett. Having visited harmonica factories all over the World, they have created a range of mouth organs that are well priced, smartly built and are tuned to meet the requirements of the harmonica players. König & MeyerKönig & Meyer is a leading global manufacturer of music accessories. For more than 65 years K&M has stood for high quality products. Harmonica AmpsThe Harmonica Company prides itself in providing accessories that are geared for the Harmonica (“Harp” “Mouth Organ”), and here we provide a top quality choice of Harmonica amps. Our range includes Pignose amps, stylish Supro Amps (a brand that has a legacy creating top quality amps since the 1930’s) and the well known Fender amps. Harmonica Cases & BeltsThe Harmonica Company: Range of harmonica carrying cases and belts. Harmonica CombsHarmonica Combs Custom harmonica combs can improve the airtightness of your harmonica, making it more responsive and improving the tone. The Harmonica offers a range of hand flattened harmonica combs for some of the most popular harps from Suzuki and Hohner. Harmonica Tools and PartsHarmonica Tools and Parts Harmonica Tools and Parts. Here you’ll find a range of tools and parts to help you get the most out of your harp. We stock a range of custom made tools and parts from Andrew Zajac in Canada. These include custom combs for many of the most popular diatonic harmonicas, tuners, embossing kits and various toolkits. Most harmonicas are mass produced and, as a consequence, greatly benefit from fettling. With the correct tools this can be a simple and rewarding process that can massively improve the tone and playability of your harmonica. Furthermore, it can open up new avenues of playing, such as making overblows more easily accessible. Custom combs can improve airtightness, as they are flattened to much finer tolerances than production combs. Improved airtightness has beneficial effects on both tone and the feel of your harmonica. We also stock Zajac’s inexpensive Marine Band conversion kit, which enables the 1896 Classic to be converted to a much more user friendly bolted design. The Hohner Nylon harmonica case ensures you keep your harps in high quality condition by offering a sturdy way to transport them. This Hohner case is made out of a strong nylon material with a robust zipper and a practical hand strap. It offers space for 7 x 10-hole diatonic Richter harmonicas. Categories: Harmonica Cases & Belts, Accessories, Manufacturer, Hohner. 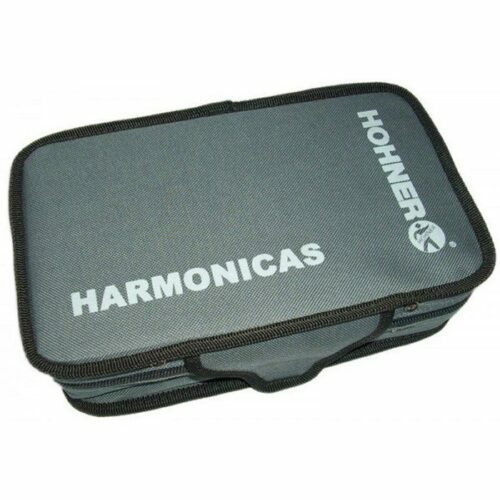 Tags: Harmonica Case, Hohner, MZ91150. What Harmonica Should I Buy as a Beginner?